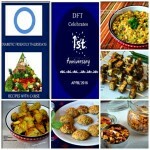 Celebrate the month of May with Team DFT, indulging on some delicious and hearty wraps that are diabetic friendly and weight watchers friendly. 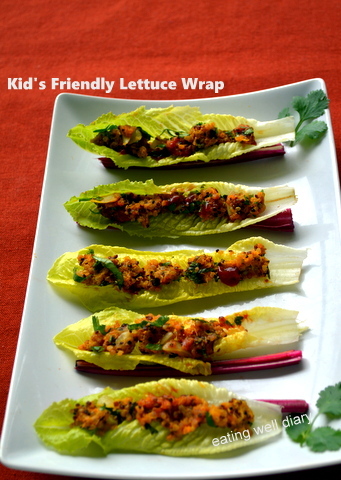 I have a delicious lettuce wrap that is even kid friendly, as it was well appreciated by kids in my house! The filling is made with quinoa and sweet potato, both very nutritious and rich in vitamins. 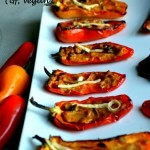 What’s more interesting is that you can make this as a snack, an appetizer or part of a meal. The lettuce makes it light enough to be a great snack. 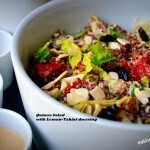 What is great about quinoa is that it is gluten-free for those who cannot eat wheat based wraps. It is also rich in protein and low in carbs, hence perfect for diabetic people. Sweet potato is a “super food” vegetable, high in beta carotene, vitamins A, B, C and minerals. Although it is sweet, has potential to reduce blood sugar. Check for more nutrition fact here. The combination of quinoa and sweet potato is great because sweet potato acts as a binder for the quinoa and at the same time does not make it too mushy if the right amount is used. Mint and cilantro add enough flavor to make it appetizing. coriander/ dhaniya powder- 1/2 tsp. 1. Cook the 1/2 cup of quinoa in a pressure cooker with 3/4 cup of water. 2. Also cook the sweet potato with the peel in the pressure cooker, with no added water with the vegetable. Allow the cooker to blow only one whistle. Alternatively, the sweet potato can be cooked in a pan. 3. Peel the cooked sweet potato slices and mash them. 3. In a wide pan, add 1 tsp. 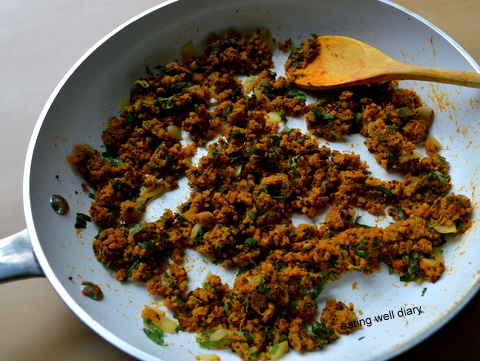 oil, saute grated ginger and chopped onions; add turmeric powder. 4. Add cooked quinoa, sweet potato and mix well. Make sure to spread the mixture so that it is not sticky. 5. Add the rest of the spices, salt, chopped cilantro and mint. Turn off the heat and mix till the filling is good enough to be spread inside the wrap. 6. Wash the tender leaves from the inside of a bunch of lettuce, arrange on a plate and spread the filling. Use beet stalks or slender carrots to prop them up. 7. Garnish with more cilantro leaves, and lightly add Sriracha sauce if needed. Kids may not like the added heat, though! 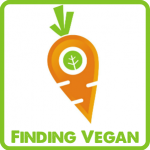 Linking at the Plant Based Linky #85 at Urban Naturale. Also taking these beauties to Fiesta Friday #119 co-hosted by Ahila @ A Taste of Srilankan Cuisine and Dianne @ Goats and Greens. Thanks, dear. Yes, I absolutely love sweet potato, it is so versatile. 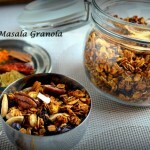 Loved the recipe Apsara .. So healthy and nutritious! Pingback: Egg White Salad Whole Wheat Tortilla Wraps – LET'S COOK HEALTHY TONIGHT! Apsara, these look delicious! Pinning them for later. Thank you, Lee. I do hope you try these. Thanks for stopping by! This looks like a great finger food recipe, and I’m eager to be around and testing this out! Sweet potatoes are so versatile. When I first saw the photo, I thought you were stuffing endive leaves — which would also work with this. This is a great recipe for Fiesta Friday, thanks. thank you so much, Ahila. Yes, this is a nice any-time finger food. I’m sure they will love it! Do let me know if you try them, Sadia. Thank you for visiting! I am a huge quinoa fan. I have made quinoa-sweet potato cutlets before. 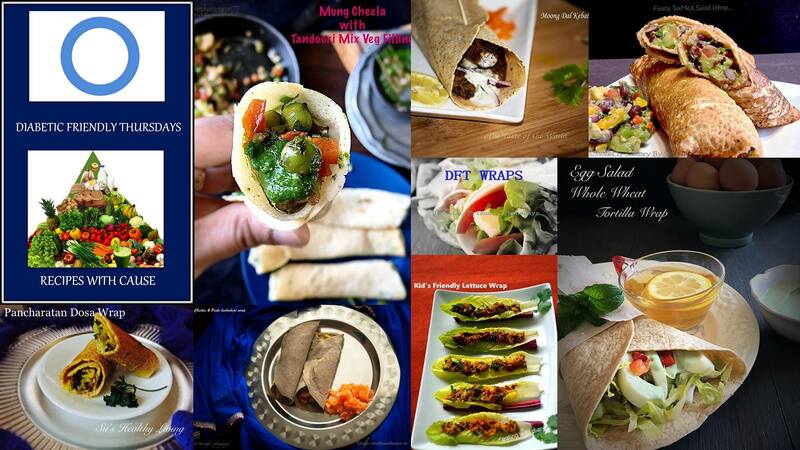 Love the idea of making a wrap, that too with lettuce! Will definitely try this! 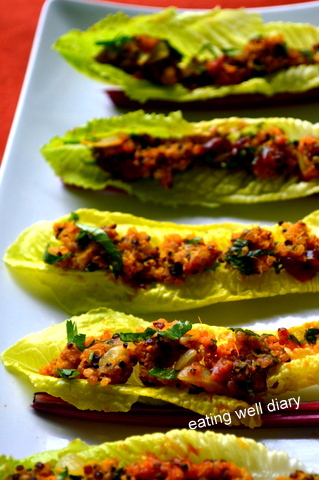 This Lettuce Wrap with Quinoa-Sweet Potato filling is my kind of happy, hearty, healthy dish. Thank you for sharing it with us at the Plant-based Potluck Party. I’m Pinning and sharing this! Thank you, Deborah. I’m so glad you like these. Thank you for the opportunity to link up. The filling is really good! !